Intra-terrestrial Soundings, by Amy Youngs' is an installation that offers human participants an opportunity to tune into bodily experiences and vibrations made by tiny, soil-dwelling beings. Humans continue to be interested in detecting signals of extraterrestrial life in outer space but have overlooked the intra-terrestrial signals of life, such as worms and insects that sustain our own terrestrial existence. This highly amplified environment allows humans a chance to appreciate these extraordinary life forms through sound and infrared video. Intra-terrestrial Soundings by Amy Youngs, 2004. Artists/Theorist Shannon Bell feels the vibration of the worms. Human participants enter a gallery containing a worm box covered in soft artificial fur wired to a chaise lounge covered in vinyl. 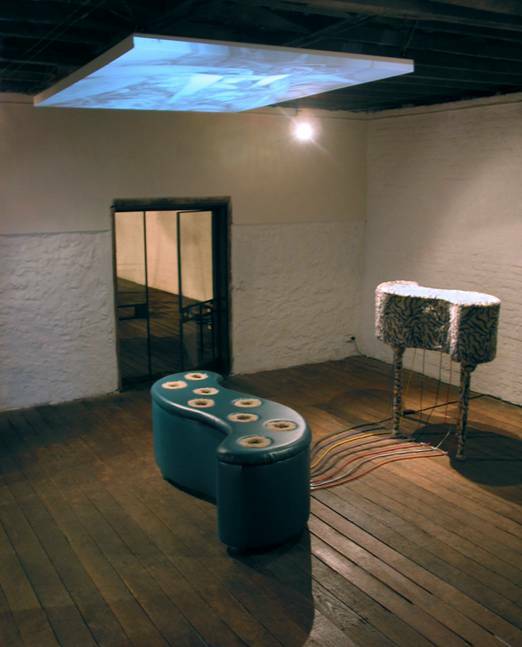 The participant/viewer, who sits or lies down on the chaise, experiences vibrations of the live sounds of the worm box, which are highly amplified and directed into eight speakers embedded in the chaise. Human participants are able to spatially locate the activity inside the worm box based on the location of the speakers just underneath them. The viewers are able to "feel" the vibrations of the worms and other insects in the box, who are going about their regular activities of eating, moving, and making fertilizer. An infrared camera inside the dark container feeds live, projected images onto the ceiling to provide viewers with visual confirmation of the life inside. Hopefully, this experience will give the viewer/participant a different sense of the life inside the earth, one that goes beyond the scientific and instead approaches something more akin to fellowship, communion, or appreciation.